2. I started my running program on Jan. 5th. Every Monday, Wed, and Friday I get up at 5:15 and run with a group from our church. I am feeling really good and am excited about my first 5K since college coming up on March 1st! 3. Remember my debut into superstardom? Well everyone needs to visit www.southernliving.com/chooseyourhome!! SL is having a home giveaway. You can start March 23, 2009. The winner will choose a vacation home among 4 choices. A casita at Traditions is one of the choices. You need to watch this to find out why if you win you should choose the home in Bryan, Texas!! Watch out for the crazy lady making no sense! Molly celebrated her 5th birthday today with her friend Judd. Molly and Judd met while in utero over 5 years ago....they are in the same PreK class this year. Judd's b-day is a week before Molly's so we combined parties this year. Molly had a blast, she and a few buddies kept sledding down together. Ally was so in awe. She hardly said a word the whole party. She took turns going down with Mommy and Daddy. Lots of family came in, my parents, Geoff's parents, My brother Erik and his Laura along with my cutie pie nephew Nolan, and my cousin Nicole and her hubby Jamey. Thanks guys, it was fun. Here is a slideshow of the festivities! Today is your 5th birthday...yes, 5! You are so close to reading on your own, so you will be able to read this I am sure before your next birthday. Yes, 5 years ago today it was also a cold Thursday in January. Your Daddy and I went to the hospital at 7 am to be induced. A very easy induction and labor was followed by 3 pushes and you were here at 5:31 pm. We were totally amazed by you and fell in love with you instantly. As did all the other family members present and the entire hospital staff. I believe they were in awe of your cuteness with tons of curly black hair! The years have passed us by with you growing so much each passing year! 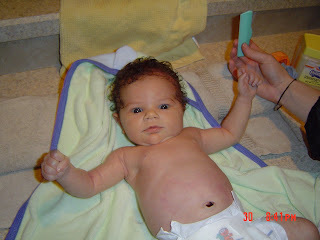 Here you are on your very first birthday! 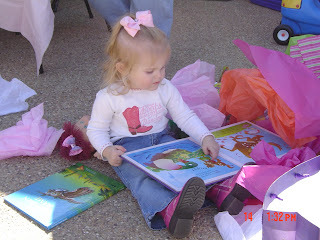 This was at your 2nd birthday party--a Cowgirl Party! Your 3rd birthday opening a package of gum (you weren't allowed gum until age 3!) --notice baby sister in the background! Here you are today, your birthday, after celebrating with your friends at school and a yummy chicken nugget lunch from McDonalds! Tonight is grilled hot dog and mac&cheese per your request. Tomorrow lots of family is coming and we will celebrate even more at your party on Saturday. 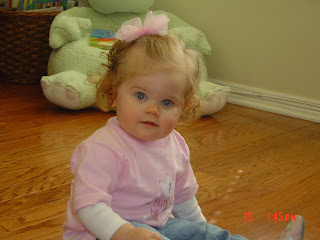 Happy 5th Birthday, Molls! Molly and Katelyn (aka Katie Beard) met when they were 1. Katie Beard's parents, Kyle and Alisha had just moved from Arizona to College Station...we all became fast friends. 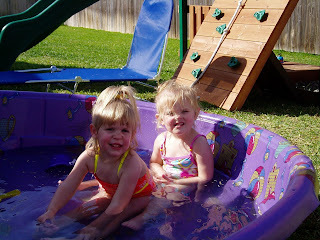 Molly and Katelyn spent a lot of summer days in the pool, had lots of tea parties, held dance contests, played on play structures, partied at Chuck E. Cheese, tumbled at gymnastics class, and so much more. Sadly, the Beard family moved to The Woodlands almost 2 years ago. We still see them once in a while, but now instead of twice a week play dates it is more like twice a year...but we are so thankful for old friends. Molly and Katelyn -- The early years! It was brought to my attention by my sister-in-law that I have neglected my blog for quite some time. It amazes me how busy we all get during the Holiday season. We had a great Christmas/New Years. We stayed here at home for Christmas Eve and for Santa to come visit Christmas morning, then we headed north to Waxahachie to have Christmas with my family. Then, the Myers family joined us here in Bryan for New Years! I will try to pick out some of my favorite pics from all the Christmas festivities! The girls checking out all the goodies that Santa brought them!! Ignore scary Mommy in the picture. Their favorite gifts were their bikes. Molly got a Barbie bike (with 2 wheels as she says) and Ally got a princess bike. Molly does great on hers, Ally doesn't quite get the pedaling part, but she will soon enough! Molly teaching her little cousin Nolan who knows what-- he does look intrigued! Ally peeking out of her and Molly's new puppet theatre from Mimi and Pops (aka Santa). Molly riding her and Ally's new Giddy up and Go pony in her Fancy Nancy gear! Poor Molly woke up on Saturday after Christmas sick. This is her while we were all opening gifts. She didn't open a single one before she started throwing up...we took her in and she had strep throat and a bad ear infection. It was later that afternoon when she finally was able to keep stuff down and felt better. Poor thing...you know she's sick if she isn't interested in presents! For some reason I have no pics of our New Years with the Myers fam. Sorry. We had a great time watching movies, getting haircuts by Aunt Sisi (Geoff's sister Jessica) and eating lots of yummy food!! Hope you all had a great Christmas and New Year. I am hoping 2009 proves to be a wonderful year!